I didn’t remember that but today is my Blog’s one-year Anniversary! Thanks WP for letting me know. This is also my 400th post! Thank you to the WP bloggers community and to WP staff, for making this year a very special one. Blogging has been a pleasant discovery. I came here to share my thoughts and learn to write better. I followed excellent blogging, writing and photography courses, and learnt how to blog and to improve the looks and structure of my blog. Totally out of my first script, I have also included photography in the blog, which became a bigger part of the blog than writing. I met wonderful people, I made friends, I met them in person, and all of them showed me that blogging happens through connections and regular interactions. Blogging is all about being part of an inspiring and encouraging community! Here we discover new ideas, learn about other cultures and ways of thinking, and in turn, expand our minds and knowledge, and learn more about ourselves, in a respectful environment. Here I dare to experiment, and to share my learnings, being sure to get support and criticism, which helps me to grow and become a better blogger. I love this community and I am proud to be a member of WP. Your support to my blog, through your visits and comments, make me want to excel and do more for you. The ever friendly Happy Engineers and editors also make this experience worthwhile. There is no better place to be than at WP with you. Heartfelt thanks to all of you for a wonderful year! Congratulations Lucile, hard to believe you have only been doing this for one year, and happy to be part of your community and to be one of those lucky enough to have met you in person! Here’s to the next year! Thank you Andy! It went so fast that I was surprised to get the notification from WP on the anniversary! Likewise, I am happy that we met in person and for all interactions we have had. Thank you! Yay, Lucile! Happy Anniversary to you–I so enjoy your posts. Thank you, Lois! Likewise. Glad we met here! Thank you, Julia. You are very kind! Thank you, Mara. I promise I won’t! It’s only missing to have you back but I know you are on a mission and fully supporting you. Cheers to you too! Congratulations! Like you I have added photos and found they added interest to my blog. Thank you Betty Louise. Indeed, it is much more interesting. Congratulations. 🙂 One year is quite an achievement. Thank you! The best is that I hadn’t set any target to achieve anything, so this made me rethink the concept of achievement forever. Thank you, Rachel. Much appreciated. Congratulations–that’s a lot of posts. Your image is perfect to pay tribute to achievements. Thank you, Sally. Even I was surprised. Joining all the courses led to publishing so many posts. But I just realized that I had exported posts from my first blog at Blogger to my new blog at WP. And I guess it is not excluding the guests’ posts. I am so happy you liked the image. I though it had to be this one. Congratulations and happy WP anniversary! May there be many more to come! Thank you so much! Our collaboration is a vital part of this experience. Double thank you. Congratulations! Keep up the excellent work Lucile! Thank you very much for your support! Appreciated! Congratulations My Queen and Ninja-Lu. I am so unbelievably happy that we found each other here. Your posts and your comments and all of our interactions light up my day, make me think, make me amazed and often make me laugh. Bravo to you xox. Stop making me cry! I am touched by your words. I totally share this happiness. I never thought I could ever make friends here and you proved my theory wrong. I cherish our connection and love our interactions. I learn so much from you and feel privileged to deserve your friendship. And now I have tears too. We’re a couple of emotional ninjas. Let me just say that I feel the same way too xox. Take a bow, Bravo to you Lucile! And I’m seriously impressed – 400 posts, that’s a milestone in and of itself. I look forward to your posts, they’re thoughtful, informative, and the photos beautiful. Here’s to many more!! Thank you so much, Jill. I’m humbled by your comment and grateful to have met you here. I love your awe-inspiring blog and learn so much from you! Happy Anniversary Lucile. Glad to have found you online and to be part of your community. Congratulations. So surprised you’ve only been at this a year. You are so accomplished. I look forward to your posts and especially love your portraits! I am grateful for your generous comment! Thank you so much. Well this was surprising! I thought you’ve only been blogging for longer than a year. Thank you Elissaveta! It is lovely and encouraging comments like that which keep me going! Happy One Year Anniversary Lucile! Mine was Aug 13 so we were almost blogger twins! Your blog work is inspiring. Thank you and congratulations to you, dearest twin-blogger! Likewise. I love your blog. Happy blogging anniversary, dear Lucile! Excellent achievement and congrats on the 4th post. Cheers to another fantastic year! Happy Birthday. And 400 posts….OMG! You really are da man! I don’t even know how many posts I have, but nowhere near 400, I’m sure! Thanks Badfish! 400th was madness. It happened without awareness….joining all these courses and posting, plus what you do as you wish, plus guest posts, brought me here. I didn’t count it either until I got the message!! Thank you, Debbie. I must say that you’re one of the people that make blogging worth the effort and I highly value our connection and chats as well. It’s a mutual feeling. Thank you, Deborah. Likewise, I’m so happy we met here. My dearest !!! What an amazing 365 days full of your amazing blog!! I cannot imagine my blogging life without your presence and I’m thrilled to have found your very special blog that combines your meaningful words together with your fabulous portraits of street life and beyond! 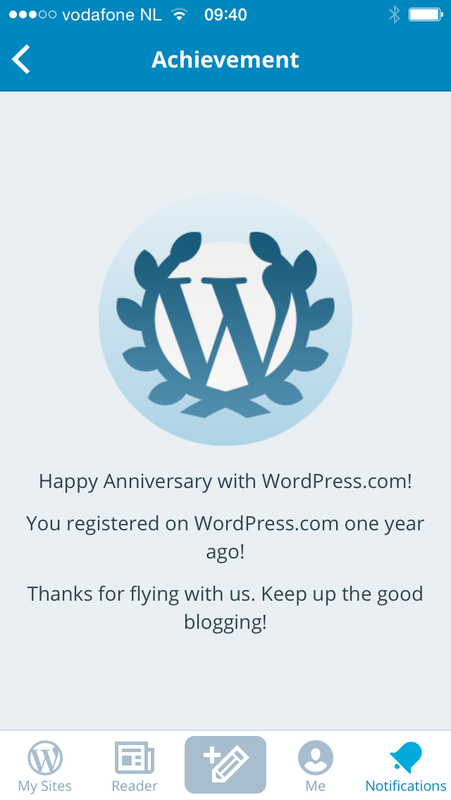 Happy First Blogoversary and here’s to many, many more!!! Oh Lia, this is so beautiful and heartwarming! Thank you so much! I’m overwhelmed with your inspiring words and I’m speechless too. I hope to continue blogging in a way to never disappoint you. The cake arrived here beautiful, full of love and delicious! Heartfelt thanks! Congratulations on your 1st Anniversary, Lucile! I cannot believe that it is almost a year ago that we ‘met’ on WP, but I’m so glad that we did! Love your blog, your photos, your stories…keep going!